It's been nearly nine years since Bitterblue became queen after her tyrannical father's rule, and the kingdom of Monsea is still struggling. Monsea has undergone tremendous change, but the young queen finds herself buried under paperwork, unaware of what truly happens outside of her tower. So she sneaks out one night and goes into the city, pretending to be peasant in various taverns. It's not long before she meets Saf and Teddy, two young thieves who steal to right the wrongs of King Leck. Bitterblue befriends them and, not realizing she is their queen, the two young men open her eyes to the true state of her kingdom, and the cause for it—betrayal and deception among those Bitterblue trusts the most. Kristin Cashore has written another magnificent novel, just as riveting and emotional as Graceling and Fire. Bitterblue is such a wonderful main character—she's inquisitive and brave, and even though she struggles with the day to day business of being queen and managing her advisers, her passion for her country and the people is genuine. Her decision to go into the city is as much of an attempt to learn more about her kingdom as it is a step of freedom made for her own sake. Throughout the novel she must deal with all sorts of inner pain and doubt when it comes to the memories of her parents, the confusing time spent with Leck, and trying to learn the truth about all of the things she doesn't understand. Saf and Teddy aren't able to help her directly with these problems, but put her on the right path towards figuring them out. With the help of trusted friends and family members, she slowly begins to uncover a conspiracy to hide what Leck did and deciphers the secrets both parents kept encrypted. There are many twists and turns throughout the plot, plenty of skillful and (sometimes) surprising character development, and a good deal of heartbreak as Bitterblue delves into the darkest memories of Monsea in order to better understand how to help her country heal. This theme of uncovering the truth and moving beyond a legacy of pain and suffering is strong and wrought with pain, but it's executed perfectly in Cashore's skilled hand. Her writing is expressive, complex, and full of feeling. She's spectacularly talented, and the way she weaves Bitterblue's story together with the prequels Graceling and Fire is both impressive and delightful. Bitterblue is full of perfect amounts of drama, pain, emotion, humor, and romance with a stunning ending that will leave readers wondering where Cashore will take them next. Cover Comments: I love the cover. The blue and purple are pretty, and the keys are so significant to the book. Not only does Bitterblue have to unlock secrets of her past, but she also does some literal unlocking as well. The cover is gorgeous! This one will be available May 1st, 2012! 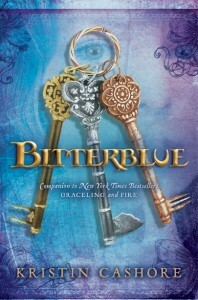 Note: It doesn't matter which order you read Graceling and Fire in (though I say start with Graceling), but note that Bitterblue is a direct sequel to Graceling, and a companion to Fire. However, as there are a couple of major Fire spoilers in Bitterblue, I recommend reading both before Bitterblue! You can read my reviews by clicking on the links above. NO! Not right in the middle of the mad AP exam rush! NOOOOO. I cannot wait for this book! I've been waiting so long for it! SO envious you got a chance to read this!!! Sounds like it's going to be great! The cover is gorgeous. I have not yet read any of these. I am SO jealous that you got to read this ahead of time. Was it an ARC? Bitterblue was such a tough little thing in Graceling. I'm glad to see she won't let herself get trampled by those older and craftier than her.